The depth and breadth of our alliance provides us with expertise in EY, KS1 and KS2 with specialism in Special Educational Needs. tailoring programmes for your setting to achieve maximum impact. Visit Makaton's YouTube channel for small clips of their Sign of the Week. Why not share them with your class? This week the sign is April. Follow us on Facebook - we'll be posting a new sign each week. 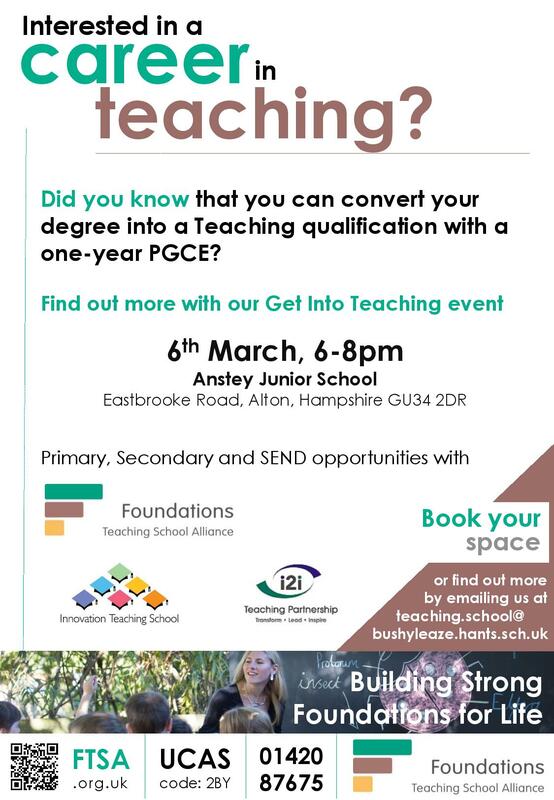 Have you seen the latest advert from Get Into Teaching? It really highlights the impact teachers have by inspiring, nurturing and shaping children and young people at all stages of their learning from Early Years to GCSEs. Bushy Leaze, Lanterns and Haven, have come together to form the Foundations Teaching School Alliance with the sole aim of supporting, training and shaping the teachers of today and tomorrow in Early Years and Primary education. 3 schools - 3 clusters: Alton, Winchester and Gosport. We wish you a restful Easter break. If you are considering training to teach, why not take this time to apply to our Initial Teacher Training programme? We are delighted to announce that ALL of our 2017/18 cohort of ITT** students have secured employment as NQTs within our cluster of schools. ​ With our support and guidance, they have become creative, confident, engaging teachers and we have enjoyed training each and every one. Our pupils are very lucky to have them.